Home Market Who is leading the race of 5G… China? We curated a lot about 5G key figures and the investment done in that market at AthisNews. 4G is still in deployment and got used by consumers, but 5G is coming soon, U.S. and European carriers expect to start 5G networks in several cities by the end of this year. Indeed, Verizon is on track to launch 5G broadband offering in 2018. AT&T names first three cities to get its ultra-fast 5G network. T-Mobile to launch 5G in 30 cities this year, including New York and LA. Sprint to Launch 5G Network in 2019. Meantime, China has pledged to having national 5G coverage by 2020, and the government is working closely with its private sector to motive developments. Indeed, all major wireless providers (China Mobile, Unicom & Telecom) have conducted extensive 5G trials and committed to 5G commercial launches while the government has opened up significant amounts of both mid- and high-band spectrum. Being the leader in 5G matters! So who is really leading the race of 5G… China? “China is firmly moving ahead with its plan to commercially launch 5G in 2020″ […] “We remain highly confident that China’s cumulative 5G capex in the next 5-7 years will be very large, although how big it will be in 2019 is uncertain,” wrote the analysts at Wall Street research firm Jefferies in a report released to investors during the last Mobile World Congress trade show in Shanghai. Country comparison – Sites per 10,000 people. Credits Deloitte. Deloitte depicted, in a recent report, the reasons why China is leading, and warn that countries that adopt 5G first “are expected to experience disproportionate and compounding gains in macroeconomic benefits caused by “network effect.” and according them “Since 2015, China outspent the United States by $57 billion in wireless communications infrastructure and built 350,000 new sites, while the US built fewer than 20,000. The gap is only set to grow. China’s five-year economic plan specifies a further $400 billion in 5G-related investment. According to GSMA and GTI at ET “China is expected to become the world’s largest 5G market by 2025 with fully 430 million 5G connections, or one-third of the global total” […] “All three Chinese mobile operators are currently conducting live 5G trials as part of a multi-year plan that includes research and development and a network deployment strategy” […] “China’s leading role in 5G is backed by a proactive government intent on delivering rapid structural change, said Mats Granryd, director general of GSMA. We had also a look at the report conducted, this year, by Analysys Mason for the U.S. wireless trade association (CTIA) which is a comparative assessment of ten nations and derived a 5G Readiness Index, an indicator of which countries are currently leading the race to 5G. Research ranked 10 countries across key factors to determine which were the most 5G ready. Credits CTIA/Analysys Mason. This index measures each government’s progress in moving toward conducive 5G spectrum and infrastructure policies, and each country’s industry investment. Recon Analytics conducted a historical analysis of the economic benefits nations derived from leading the world in prior generations of wireless, as well as the costs associated with losing leadership. These analyses quantify the stakes of winning or losing the 5G race. 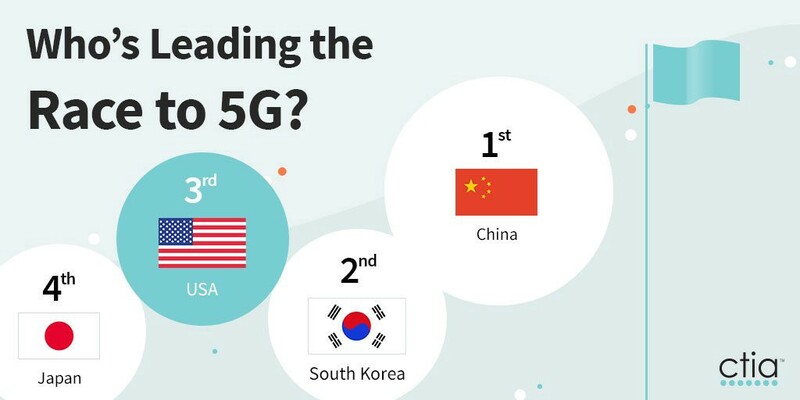 According to Analysys Mason, China, South Korea, and the United States are currently leading the race to 5G, with China holding a narrow lead. America’s 4G leadership resulted in economic and job growth that would have otherwise gone to other countries. Losing wireless leadership in 3G and 4G had significant, long-term, negative effects on the Japanese and European telecommunications industries. America’s wireless industry is a global leader in making the commercial investments and preparations necessary for 5G deployment. Policymakers have proposed forward-looking legislation and regulatory reforms that can help America win the race to 5G — but these proposals need to be addressed quickly in 2018. Tier Three ? Canada, Russia, Singapore, why? 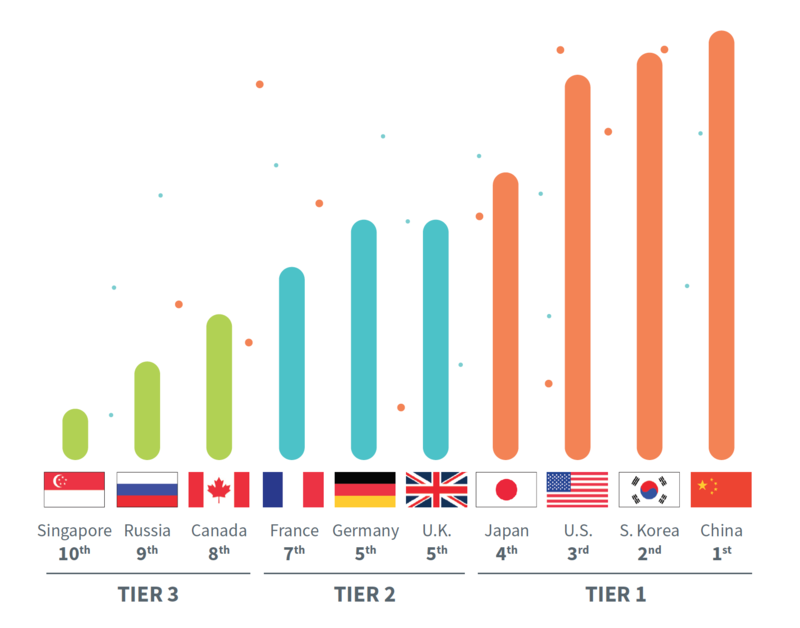 According to Analysys Mason, these countries are in the lower tier because wireless providers have not shown a commitment to date to 5G deployment and policymakers have not made progress in developing a 5G strategy or identifying the spectrum bands necessary for 5G services. For instance, Russia’s 5G roadmap does not contain plans to license spectrum and only one provider has committed to 5G deployment in 2020. According to Analysys Mason, China holds a narrow lead in the race to 5G thanks to a combination of industry momentum and government support — the country’s latest Five-Year plan aims for broad commercial launch of 5G by 2020 and each of China’s providers have committed to this timeline. As we said, all major wireless providers have conducted extensive 5G trials and committed to 5G commercial launches while the government has opened up significant amounts of both mid- and high-band spectrum. Specifically, China’s regulatory authority has committed to release at least 100 MHz of mid-band spectrum, with a focus on 3.4-3.6 GHz, and 2 GHz of high-band spectrum for each wireless provider. Emerging Techs addict, Thomas is specialised on Nano/Micro Techs & Semiconductors Market. Thomas holds a PhD in Microelectronics for wireless & imaging applications & a Master Degree in Sales & Marketing. He has 13+ years of demonstrated achievement in managing projects & Technology Developments. At AthisNews, he shares fresh Market Insights & Technology Analysis done by global experts.